As a person who was raised to love God and family, in that order, I especially cherish Christmas time. 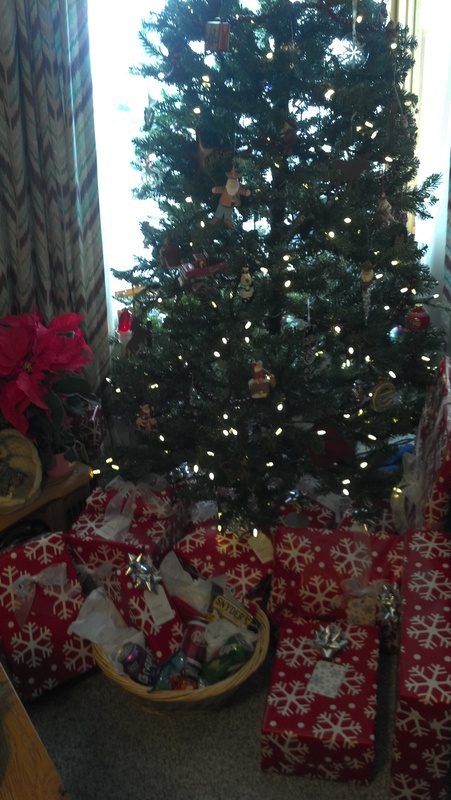 Do you remember as a kid searching for where your parents might have hidden your gifts? Oh, I do! My brothers and I waited for the day we knew our parents had a tax appointment and wouldn’t be home when we got off the bus from school. Yes – we thought we were pretty much the next closest thing to Magnum P.I. (only us products of the 80’s are going to get that one, heehee) in solving our own little mysteries! And, what an anticlimactic experience to know what I was opening on Christmas morning…I only made that mistake of actually peeking at the unwrapped gifts one time! Gosh – I did enough speech and drama in school, that acting shouldn’t have been totally difficult, but the element of surprise is pretty challenging to show if it isn’t genuine! I got a chance on Sunday to wrap gifts for our family and friends while Matt and the Kids were deer hunting and checking cows. It’s good to have that task done, but more importantly, I got to have what I wanted going on TV, not to mention eating crazy combinations of food for my meals, like having wine with nachos for lunch. Yum! Being a girl with time alone (every once-in-a-while)…gotta love it! As much as everyone loves a fun surprise as a Christmas gift, no one wants surprises when it comes to their food. More and more, it seems, people want to know how their food was grown, where it came from, who grew it, and on and on. This year, more than ever, farmers have been making a concerted effort to explain farming and food production. As 2011 comes to a close, I am in awe as I think of all of the blogs, tours, town hall meetings, videos, TV and radio interviews and dozens of other efforts that have taken place between farmers and consumers throughout the year. I can’t help but be excited for opportunities to arise in 2012. As more people leave the farm to pursue other interests and fewer of us are left to grow the food, we need to work hard to explain our work more often and more thoroughly. So, my Christmas present to anyone reading this???? (Sorry if I’m ruining your Christmas morning surprise from me)… My continued dedication to do things right as a caretaker of the land and livestock, resulting in the safest, most delicious, food you can get from South Central Nebraska and North Central Kansas. And…more blog posts to tell you what we are up to on and off the farm. 🙂 Thank you so much for reading! Contribution can be made in so many ways…financial, items, talents, time. Today I am at the Nebraska Farm Bureau Annual State Convention and the room is chock full of farmers and ranchers contributing time, knowledge, and experience and well-thought discussion points to all of Nebraska Agriculture. 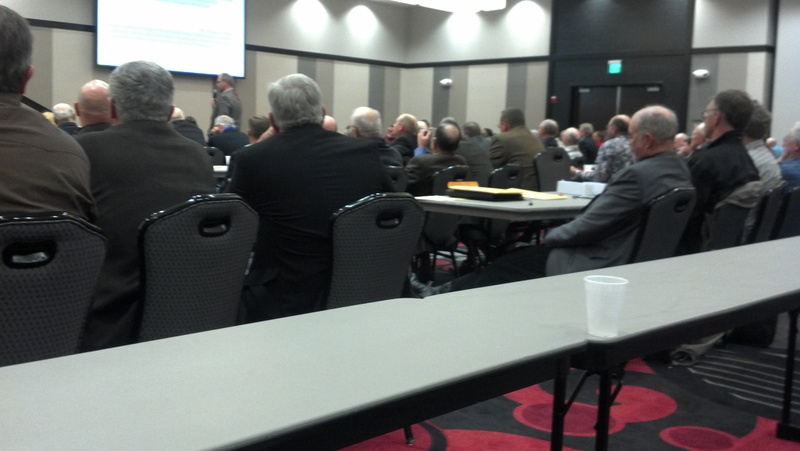 Farmers and Ranchers of Nebraska working hard to develop policy. There are so many people who contribute in so many different ways to make this country we live in the best in the world – I am ever grateful for those in the medical profession, education, construction, and especially dark chocolate and red wine makers (hee hee). Those of us in agriculture may not be a significant amount of the U.S. population, but we are so very integral to the livelihood of all. We are responsible for the production of food, fiber and fuel, as well as many other essential-to-life items, made from the by-products of our primary goods (grains, livestock, cotton, etc.). How those crops and livestock are handled from farm to farm can be vastly different, but the end goal should always be the same: a safe, wholesome, and abundant food supply. Imaging putting nearly 200 people of any profession in the same room and asking them to agree fully on some type of policy wording. Wow! How amazing to have witnessed today, farmers and ranchers of Nebraska working through hours of discussion and voting for consensus on policy that could affect their farms and livelihoods directly. What I watched was contribution to farming at it’s best! Yes, the daily work on their farms is essential to end product and every level of sustainability, but providing input as to potential restrictive or opportunistic legislation is every bit as important & this group shined! As we conclude elections and enjoy the banquet this evening, there are many mentally exhausted people who should feel extremely proud of the work they are doing to help assure a strong future for Nebraska agriculture.